Woven consoles by Oliver M. Furth and Tanya Aquiñiga disrupt boundaries for contemporary weaving. 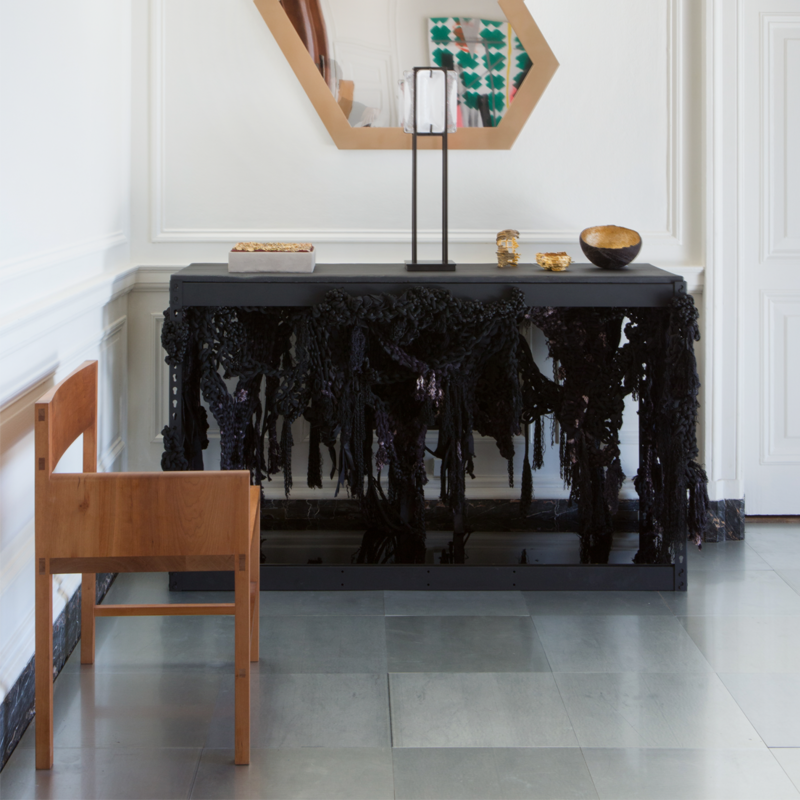 Kelp Forest, designed by Oliver M. Furth and Tanya Aguiñiga, features two unique consoles of reclaimed, woven fibers, negotiating a matte black nickel-plated industrial framework. Drawing inspiration from underwater landscapes, as well as theater stages and operatic dramas, Kelp Forest focuses on space, depth and concepts of foreground, middle ground and background. Aguiñiga's rich textures of knotted cascading rope, satin and canvas set the stage for a visual scene that entangles the viewer. Furth's contribution, the design of a structure incorporating re-imagined use of industrial-grade materiality, disrupts notions of quality and luxury. Together, Aguiñiga and Furth question conventional definitions, and contextual boundaries for contemporary weaving. With the exception of a few artists including Aguiñiga, weaving, which has gained a new appreciation amongst art and design enthusiasts today has remained largely in stasis, unchallenged since the medium's creative apex in the 1970’S. Kelp Forest serves as a catalyst to push the narrative forward—taking the medium ‘off the wall,’ and proposing new ways for artisans, makers and designers to work within the form.